Night 13 in Birmingham kicks off with a match between Michael Smith and Mensur Suljovic. Following another defeat last week, Smith remains at the bottom of the Premier League table, and really does need to win his four remaining matches to have any hope of reaching the play-offs. Suljovic is one of three players tied on 14 points, and needs a win here to continue his push for a place at the O2 next month. Although he has deserved better in recent weeks, Smith is without a win in his last four Premier League contests, and lost 6-0 to Ricky Evans in his opening match at the German Grand Prix at the weekend. These are worrying times for fans of the ‘Bully Boy’, and Suljovic comes here with a better record this year. However, a big performance from Smith could be just round the corner, and one area where he should dominate the Austrian is in the 180 department. Smith has hit a PL high of 41 this season, whilst Suljovic has hit 31, including just two in each of the last two weeks. If Smith can get into his rhythm early, he should outscore ‘The Gentle’ in the 180 market. Fresh from losing his place at the top of the table last week, Rob Cross faces Gerwyn Price on night 13. For the second time in this Premier League campaign, Cross took a heavy beating from Michael van Gerwen last week, but he can still be satisfied with eight wins from 12 matches so far this season. Price went through a bit of a lean spell midway through this campaign, but has won three of his last four PL matches now, so both players are in good form coming into this one. 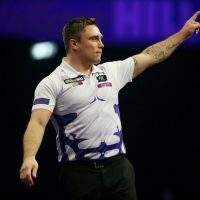 The Welshman took the week off from the European Tour, whilst Cross played some good darts in reaching the semi-finals of the German Darts Grand Prix, before losing to MvG once more. He averaged 94, 111 and 105 in seeing off Michael Rasztovits, Daryl Gurney and Mensur Suljovic before another disappointing showing against the World Number one. This should be an entertaining contest, but preference is for Cross to put those defeats to van Gerwen behind him and all but confirm his place in the play-offs. He’s won their previous two Premier League fixtures, and he’s playing well enough to make it a hat-trick of victories against ‘The Iceman’. Peter Wright takes on Daryl Gurney next, and to reach the play-offs at the O2, it’s a game ‘Snakebite’ really must win. Wright has just two victories to his name this campaign, a 7-5 victory over contender Steve Lennon and a 7-3 win over Raymond van Barneveld, so hasn’t beaten anyone who remains in the Premier League. Gurney has only picked up one point in his last three Premier League matches, so also needs a win to get his campaign back on track. Wright suffered another disappointing weekend on the European Tour, losing his opening match to Ross Smith, whilst Gurney can take some positives with a victory over Kyle Anderson and then a 101 average in a close-run 6-5 defeat to Rob Cross. With Wright changing his darts from one week to the next, there’s more consistency to Gurney’s game right now, and that could give him the edge in this encounter. 8/1 Darts winner on Judgement Night in the Premier League !!! Premier League Darts winner at 8/1 !!! Here at Free Super Tips our expert tipsters offer free betting tips on a wide range of sports, and the growing popularity of darts betting hasn’t evaded us. If you’re wondering who to back at the next darts tournament, look no further than our expertly selected free darts predictions. Whether you’re watching the PDC World Darts Championship, the Betway Premier League Darts, or one of the many unranked tournaments – we have darts tips for you. Our tipsters thoroughly research each tournament and dig out the best value for our darts tips. Not only this but we also ensure you get the best odds available by scouting out the best price for our darts predictions. We aren’t called Free Super Tips for nothing – There are absolutely no subscriptions, sign-up fees, or memberships to worry about. We simply provide you with the very best darts predictions for all the big matches! When Are Your Darts Tips Posted? The times for our darts predictions for the major tournaments varies depending on the fixture list, but for the Darts Premier League we update our darts betting tips page on the Tuesday in preparation for the fixtures to be played on Thursday. Overall major tournament predictions will be posted in the days leading up to the start of the event to give you plenty of time to back our darts tips before the tournament gets underway. Make sure to check back on our darts betting tips page every week for all the latest predictions. Beginning on the 2nd of February the Premier League of Darts runs until the middle of May, and our tipsters provide their thoroughly researched darts predictions for the main fixtures of every week to ensure you get regular darts betting action. As noted above, the darts tips will be updated on Tuesday in time for the fixtures on Thursday. The PDC World Darts Championship is the biggest tournament of the PDC schedule and is held at the Circus Tavern in Purfleet between late December and early January. It’s the first taste of darts betting action of the new year, and with such a huge prize pool and the world’s best players it makes for fantastic viewing. It’s the biggest of all the PDC tournaments, so you can be sure there will be plenty of darts tips. The ‘FA Cup of darts’ changed schedule back in 2014 and is now played in March every year at Butlin’s Minehead. With unseeded draws and a wide variety of skill levels in this tournament the potential for upset is rife for even the top players, making this one of the most entertaining tournaments around. It also offers some excellent value for our darts predictions. Held every July at the Winter Gardens in Blackpool this is regarded as the second biggest tournament after the PDC World Darts Championship. It is based around a legs format, allowing us extra markets to utilise in our darts betting tips. Held in Dublin at the Citywest Hotel every October the PartyPoker World Grand Prix adds an unusual twist to televised darts tournaments by requiring players to finish each leg on a double, including the bullseye. This can lead to some unexpected outcomes, and as such our tipsters look to dig out that extra value for our darts betting tips. The Grand Slam of Darts has taken place every November at the Wolverhampton Civic since it’s inception in 2007. It’s the only UK based tournament to feature players from both the PDC and the BDO, which can result in some interesting matches for our darts predictions to focus on. Our favourite darts players revisit Butlin’s in Minehead in November as they compete for the Players Championship Finals, with the top 64 players competing to win part of the £400,000 prize fund. As always, our darts betting tips will guide you through the tournament. Taking place in a variety of locations and months since it’s inception in 2008, the PartyPoker European Championship invites the top 32 European darts players to compete for the title of Europe’s best. This year it takes place in Hasselt, Belgium at the end of October, and our tipsters will be on hand with all the darts betting tips you can ask for. The Premier League Darts and PDC major tournaments make up the bulk of our darts betting tips, but it doesn’t end there. With the BDO also hosting a number of major tournaments and countless minor tournaments throughout the season you can expect expert darts predictions throughout the entire year! We would suggest checking our darts betting tips page and our Twitter account on a regular basis to ensure you don’t miss out on our darts predictions. Our tipsters don’t stop at providing you with excellent darts predictions. They also go above and beyond to find the absolute best odds for each of the darts tips they post, Saving you the hassle of trawling through countless bookmakers to find the best odds for our darts tips. Instead you can simply visit our Darts betting page and find the best bets and the best odds all in one easy to find location. You can even head over to our Darts free bets page where both new and current members can further increase their value with an array of exclusive offers from our betting partners. For live updates on our darts tips and a range of other sports betting opportunities – along with all the latest sporting news and humour – follow us at @FootySuperTips.